Event Description: An inspiring site for a corporate team building event, Vienna boasts dazzling architecture, world-famous cafes (and their amazing pastries! ), ever-present museums and of course, the Vienna Boys Choir. Your Vienna treasure hunt spans the historic down area centering around St. Stephen’s Cathedral. Location History: Initially the Celtic settlement of Vindomina, and later the Roman garrison, Vindobona, historic Vienna owes much of its current identity to the amazing Hapsburgs, who ruled the city from 1246 AD until the beginning of the 20th century. 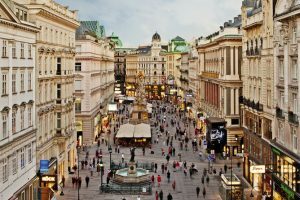 The capital of a cosmopolitan empire that once reached all across Europe, Vienna attracted the greatest minds of its generation: Beethoven, Mahler, Freud, Schonberg, Klimt to name a few. Emperor Franz-Josef I (1848-1916) brought to the city a golden age, constructing the great edifices of the Ringstrasse: the court museums, parliament, the university, etc. During your corporate team building treasure hunt…expect to encounter: the musician’s walk of fame on Kartnerstrasse; a statue of a Roman god; Roman ruins; the old Jewish quarter, and much, much more. See our other Vienna corporate team building events.